WUWM's primary coverage extends throughout metro-Milwaukee including Racine, Waukesha and West Bend. WUWM 89.7 FM - Milwaukee's NPR is committed to bringing the listeners of southeastern Wisconsin in-depth news, thoughtful conversations and smart entertainment. Member-supported WUWM is licensed to the University of Wisconsin Board of Regents and is operated by the University of Wisconsin-Milwaukee College of Letters and Science. WUWM 89.7 FM broadcasts locally-produced news and music, as well as national and international programming from NPR, APM and BBC. WUWM’s award-winning WUWM News journalists and Lake Effect producers create captivating reports that focus on local and regional issues featuring the people and cultural events that shape our community. WUWM's on-air staff follow a code of ethics, ensuring high standards of honesty, integrity and impartiality. UWM Today features the people and discoveries at UW-Milwaukee. It's Alright, Ma, It's Only Music presents hand-selected music from songwriters and bands that reach across generations. 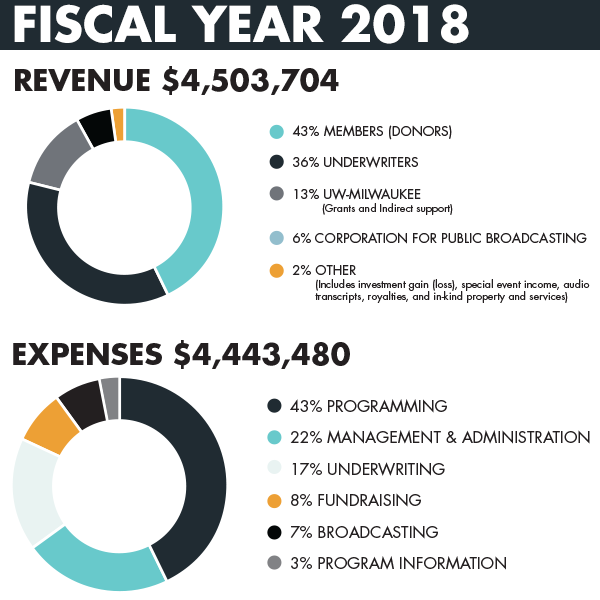 The majority of WUWM's funding comes from listener donations, foundations and business sponsorships. The Federal Communications Commission requires all stations to maintain a public inspection file. While in the past these documents were to be kept at the individual stations, the FCC now requires this information to be posted on the FCC website. Free computer access is available at most public libraries. If you need assistance, please contact Ann Piatt at WUWM Radio, 111 East Wisconsin Avenue, Milwaukee, WI 53202 or at 414-270-1110 or apiatt@uwm.edu. WUWM Milwaukee Public Radio is licensed by the Federal Communications to the Board of Regents of the University of Wisconsin System. Meetings of the UW Board of Regents are open to the public although certain meetings may be closed per state statute. WUWM's Board advises station management on policy, fundraising, programming and outreach issues. Quarterly meetings are designed to share information so that Board members can advocate for the station in the community. UW-Milwaukee is an AA / EEO employer strongly committed to maintaining a climate supporting equality of opportunity and respect for differences based on gender, culture, ethnicity, disability, sexual orientation, marital status, race, color, religion, national origin or ancestry, age and lawful activities. We particularly encourage applications from individuals who would enhance and diversify our workforce. WUWM notifies organizations and groups that assist job seekers when there is an opening at the station. If your organization would like to be added to the list, send contact information to Ann Piatt via email. To comply with Section 73.2080©(6) of the FFC's 2002 rule on equal employment opportunities, WUWM posts its EEO Public File Reports. WUWM is operated by the UWM College of Letters and Science. The Director/General Manager is responsible for day to day management of WUWM. The Director/General Manager reports to Scott Gronert, Dean of the UWM College of Letters and Science.